Do you Pinterest? I like to think of myself as a moderate user, as I haven't yet reached the over one thousand status. I also choose to ignore the hours I spend simply trawling it, as well as my hundreds of secret boards, because they don't count right? Anyway, it was through the genius of the virtual pin board that I first discovered Cinque Terre; a small little square of blue sky, blue sea and houses painted every colour of the rainbow. Shortly after a travel blog I read featured a story on the 'Five Towns' with such photographs so beautiful I couldn’t help but to look it up. There it was nestled on the Italian rivera, and not too much further than we were planning to go on our European adventure. It only took Dem a quick glance at #Cinqueterre to start looking for a hotel. It’s very difficult, if not impossible for some, to drive to the five towns that make up Cinque Terre (Five Towns), the easiest way is the train, and the prettiest way is the boat. 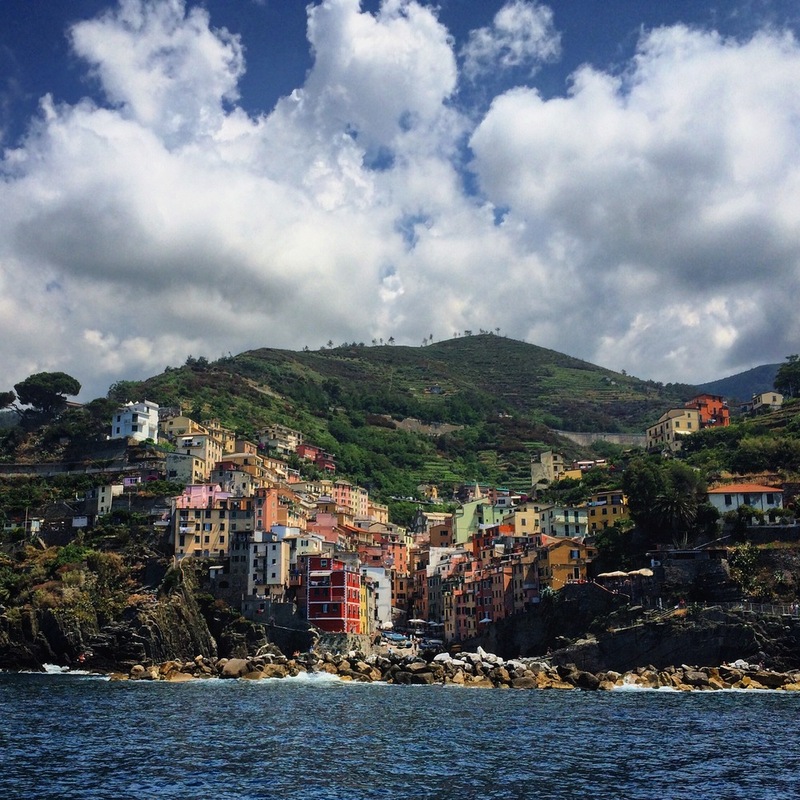 We took the train from Moneglia, the little village just further up the coast where we were staying, through tiny mountain tunnels which occasionally get way to the most spectacular ocean views, to the furtherest town of Riomaggiore. It sits in a tiny bay, facing the sea. The small beach lined with fishing boats leads straight into the one main road. It’s so strange how life can take you places if you let it. We were sat in the most beautiful spot on the Italian coast, all because I spent a little too long on Pinterest one rainy London afternoon. It’s quite fascinating to follow back through the paths you take which start at the smallest and seemingly insignificant decisions, which eventually led to the biggest moments of your life. I found that I only met Dem because my brother bought an iPhone (it’s a very long story involving Instagram, Tobi W and my need to keep up with my younger brother), although it could go back further than that. Just tiny seeds which grow into our lives. It was an interesting and quite hilarious discussion and I do suggest you try it. I had read that Manarola was the quietest and most romantic of the towns, so we took the boat there next. It is supposedly the oldest of the five towns, with the San Loenzo church cornerstone dating back to 1338. We sat on the rocks and were both very quiet for a little while. I was wondering how a little girl from Chester had found herself in such a beautiful place with the love of her life, and I hoped Dem was thinking similar, although I’m sure it was more a long the lines of what he wanted for lunch.. I would love to tell you that we stumbled across the most perfect place to eat, but in reality it was the same travel blog I mentioned earlier’s recommendation to the world that we took up. She boasted great food, great views, and away from the tourist crowds, how could we refuse? We found Nessun Dorma in Manarola very easily, you just had to start out on what looked like quite a hike around the bay. I think the heat of today had kept the majority of the masses away from the relatively steep looking walkway which eventually led to the next village of Vernazza, and as most the trail was actually closed that day those braving it were stopping at the end of the bay, getting their shot of the town back below and then descending the way they had come. Little did they know that just five minutes further and a flight of steep stairs later was a little restaurant with the most incredible unrestricted views of Manarola. We ate one of the best antipasti boards I’ve ever had and drank the local wine (grown less than a mile away). It was perfect. We didn’t have the time to explore Corniglia, which sits 100m metres above the sea, and as the heat and lunch were beginning to take their toll, I can’t admit to being too disappointed at not having to walk the steep stairs up to it. Apparently it boasts incredible views, so hopefully next time. The next town was Vernazza, arguably the most famous of the five, the main street leads to a square where there is a protected bay to swim in. We took our gelato and watched the craziees jump off the high rocks into the sea. The last town in Monterosso, usually the busiest thanks to the two beaches and the most restaurants and shops. We didn’t stop here, deciding to stay on the train to take us home. We needed more days, which we didn’t have, so we had chosen the three that appealed most to us and it disappoint. That night we had a late dinner at a local pizzeria, washed down with a few beers and slept very soundly. So come on, who’s on Pinterest?